Boulder County’s Conservation Manager Darla Arians inside the county’s recycling center. County recycling programs around the country have taken a hit — with recyclables bringing in about half of what they did in early 2017 — because of China’s crackdown on what recyclables they will accept. What is wish-cycling? And why is it harmful to recycling efforts? “It’s certainly had a financial impact — commodities we sold six months ago are no longer selling at that price,” said Elisa Seltzer, director, Emmet County, Mich. Department of Public Works, who got into the recycling business about 30 years ago. Although Emmet County never exported its recyclables to China, it’s now facing more competition for its local markets (27 factories, mostly in Michigan) buying recyclables. 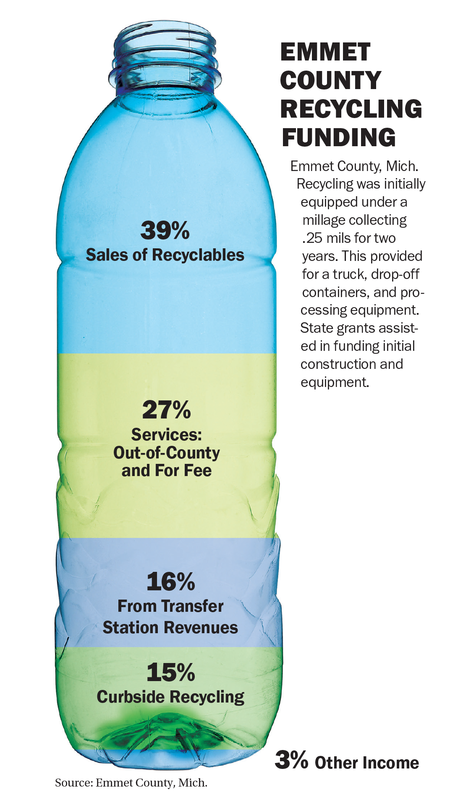 More recyclables in the marketplace means factories are paying less. “People were getting $160, $180 a ton for cardboard where now they might be getting $70 or $80 a ton for cardboard,” Seltzer said. Newsprint prices have dropped from about $85 per ton to $50 per ton. Many counties are looking at diversifying how they are funded so they’re not so reliant on markets, she said. Recycling makes up 40 percent of Seltzer’s budget with county services (27 percent), revenues from the county’s solid waste transfer station (16 percent) and curbside pickup (15 percent) making up the rest. Some material recovery facility (MRF) operators are slowing down their lines and investing in new sophisticated processing equipment, he said. This has increased costs at a time when the revenue associated with the sale of recyclables is about half of what it was in early 2017, he noted. In Boulder County, Colo., the county’s new plastic shorting machines can tell the difference between different kinds of plastic using infrared detection. A 100-horse power air jet shoots the material into the proper containers. The items were previously sorted by hand. The new machines were part of a $2.8 million system upgrade. The new equipment reduces labor costs by replacing eight manual sorter positions on the container line, jobs that are increasingly hard to fill, the county noted. The improvements were paid for via a county recycling tax that passed in 1994 but is now expired. In Emmet County, Seltzer said they are weathering the China ban recycling storm partly because the county operates all phases of its recycling process. County trucks collect trash and recycling and take it to the county-run MRF. The county uses a dual-stream MRF (dual-stream recycling is also referred to as “source separated recycling”). This means keeping the fiber component — paper and cardboard — separate from containers, including glass and plastic containers and cans. The county collects recycling in 64-gallon carts used strictly for paper, cardboard and plastic bags and 18-gallon bins for tin, glass and plastic. The county’s education and outreach to residents includes messages on its website, on the trucks and on the bins. The Public Works Department has an open line of communication with its drivers and recycling processors, getting tips from them on challenges they face. The drivers of the trucks sat down with office staff and the department’s outreach coordinator “helping us design the ‘oops!’ tags that they put on the bins if people are messing up,” Seltzer said. The “oops” or quality control tags identify problems when residents need guidance with recycling. The county’s MRF also handles recycling for neighboring Presque Isle, Cheboygan and Otsego counties. Seltzer’s advice for other counties? “The best advice I have heard is stay the course, try to find alternative markets if markets have dried up, do what you can to clean up your material and message it to your community how important that is,” she said. In Marion County, Ore., residents are getting fined as much as $15.45 per pickup for improper recycling. The county tightened its rules about recycling and drastically scaled back its recycling program due to China’s restriction on most recycled materials. It’s led some residents to ask for smaller recycling bins or cancel recycling altogether. The region’s Mid Valley Garbage and Recycling Association sends a recycling coordinator to neighborhood meetings to talk to residents. Plastic bags top the list of things that should not be put in the blue bins, San Luis Obispo County noted, because the thin plastic can severely damage machinery. Batteries are another danger to recycle. During the recycling center’s process, batteries can spark and harm recycling-center employees. Let residents know where to recycle them. Needles have been a common problem as well. There have been several times where insulin needles will end up in the recycling bin because they are made of plastic and metal, however, they are a non-recyclable hazard. Give residents guidelines on how to dispose of needles. Food scraps are damaging to the recycling process. It is considered a recycling contaminant if food packaging that was not properly washed out or food scraps are thrown into recycling. If your county offers composting, be sure to let residents know about it. Frozen food boxes are not recyclable food packages. They are lined with a wax or plastic polymer to help insulate the food. The wax makes the box “impossible to recycle,” the SLO IWMA website said. If cleaned properly, plastic frozen food trays can be recycled, but not the boxes. Paper cups, typically used for coffee, have a similar wax lining to contain the liquid and therefore cannot be recycled. Yet, the cardboard drink sleeves and plastic lids are recyclable. Pizza boxes run a fine line. If there is grease on the pizza box, then it is a contaminant and should be thrown away, but, if the top portion is not greasy, it can be cut off and recycled. Dishware is also among the list of frequently recycled non-recyclables. Ceramic is not a recyclable product. And as for glasses, the type of glass used to make dishes does not melt at the same temperature as glass bottles, so it is not processed at recycling plants. Broken glass should never be recycled, as it is a hazard to employees. It should be sealed in a box or wrapped in several sheets of newspaper. Diapers are another hazard that can end up in the wrong bin. Although disposable diapers contain paper and plastic, they are considered a bio hazard and should not be recycled. Also, the mixed materials could not be separated anyway. PVC garden hoses and PVC pipe can also damage machinery. The long hoses are not meant to be recycled and can tangle the recycling process, creating a safety hazard. Other items that don’t belong in the blue bin include: Scrap metal, clothing, paper milk cartons, ice cream containers, paper towels, Styrofoam, light bulbs, shredded paper and electronic devices. Mary Ann Barton is the County News editor and senior staff writer and is returning to NACo after previously working at the association. She comes to NACo after covering local news for Patch.com in Northern Virginia. On April 9, Adam Ortiz, Director of Environmental Protection for Montgomery County, Md., represented NACo at the U.S. Environmental Protection Agency’s (EPA) Winning on Reducing Food Waste event. On April 10, President Donald Trump issued Executive Order (EO) 13868 directing the U.S. Environmental Protection Agency to review and revise section 401 of the Clean Water Act (CWA). From the Great Lakes to Florida’s Gulf Coast, counties all around the country are dealing with a problem that can affect all bodies of water: Harmful algal blooms (HABs). This week's video includes the president’s Fiscal Year 2020 budget request, the submission deadline for comments on the new Waters of the U.S. rule on April 15 and more.